How To Beat Procrastination - A solution for "I'll do it tomorrow"
Have you ever planned to exercise, but didn’t get to it that day? You promised yourself you would try to work out later, or tomorrow. Then when tomorrow came, you got caught up in something else, or just decided you needed to “relax” for a time, until you found the day was gone and you never did get around to your workout. It’s not that unusual, because most of us procrastinate at times and it takes a lot of effort to do what we know we should. One of my friends called me recently and asked if I would be his training partner. To protect his privacy, I’ll call him Dave. Even though he really wanted to get back in shape, he confessed he wasn’t really motivated to do the work. He said he knew he would not get around to doing it himself, and he felt he needed someone to make him accountable and give him a push when needed. After thinking it over, I said I would meet him at 2pm the next Saturday outside the gym. When I got to the gym on Saturday, he wasn’t around, so I called him. He told me he didn’t sleep much the night before and was very tired. Okay. I said I would meet him the next day at 2pm if he wanted to begin training. He promised to meet me and said he would be rested and ready for the next day. When the next day arrived, he did not show up once again. He had promised not to let me down, but he actually had let himself down. I did not bother to call him that day because there was no point hearing another excuse. Many of us encounter people like Dave, who say they will do something with us and then never show up. I actually did that myself at times, and I do not feel proud of myself for it. We feel ashamed of ourselves when we procrastinate and let ourselves or others down. Most of us procrastinate at times in certain situations. It is not always linked to just exercise. For instance, you make a good plan to start your exercise program. You are going to get up at 7am every week day and work out. The alarm goes off at 7am the very next day, but you find you just cannot drag yourself out of bed to exercise. You give yourself “5 more minutes” but the next thing you know it’s time to get ready for work. Okay — you plan to start on Saturday morning instead. You get up early, have breakfast, and notice a few things you need to do first. Then you turn on the TV while you eat just to catch up on the news. An hour later, there is nothing good to watch, but you remember you have Facebook posts to answer. You chat for a while, and then take “a minute” to check out your emails and Skype. Uh-oh, now the kids are up and you promised to take them out today. Well…no time now to exercise. 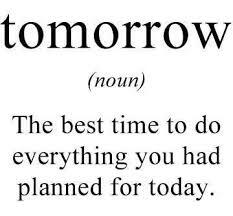 Don’t worry – you’ll do it tomorrow. And so it goes. We ALL do it — procrastination is common to most of us. 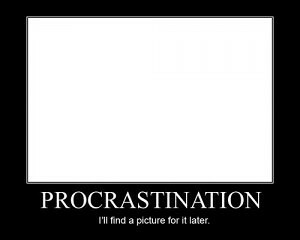 Maybe the reason is that procrastinators have nothing at stake if they don’t follow through. We usually prefer instant gratification. At heart, we would rather do something fun than something that takes effort or is difficult, even though it’s really important. But if you want a great body, you will have to make it a priority and take the necessary action. If you don’t discipline yourself, you will not have the fulfillment or the body you want. At this website, you commit to a contract that will help you meet the particular goals you set. If you do not meet your goals, the money you pay goes to a charity that you hate. This is a great motivator. If you don’t want to sign up with STICKK, give money to a friend and make the same arrangement. Set realistic goals that you can achieve and stick to them until you fulfill them. Then set more goals, and step-by-step, you will be successful and have the body of your dreams. Take action and never quit and you will succeed.